500 gm. chicken pieces, skin removed and washed. 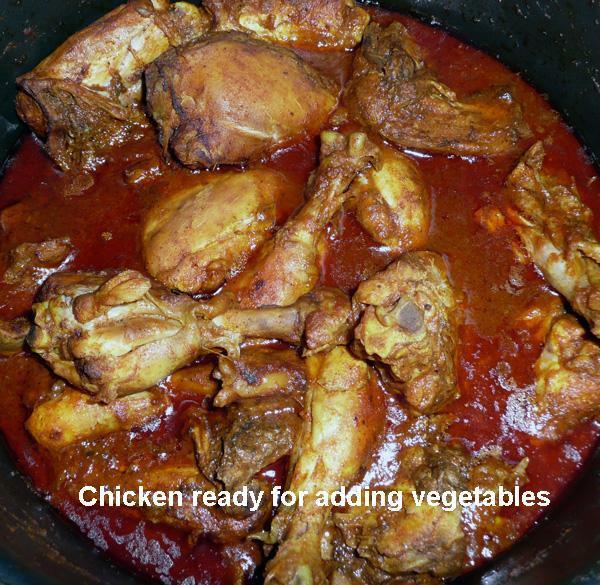 In the picture here, I have used chicken drumsticks. Mix ginger, garlic, turmeric, garam masala and salt together. 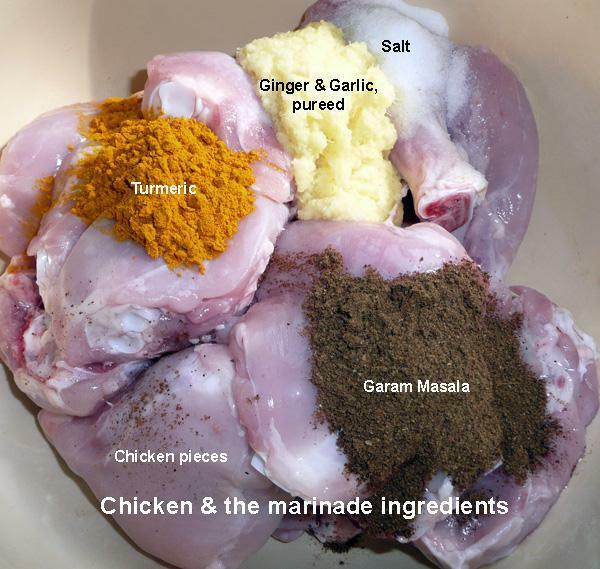 Coat chicken with this mix and allow to marinate for 2-3 hours. 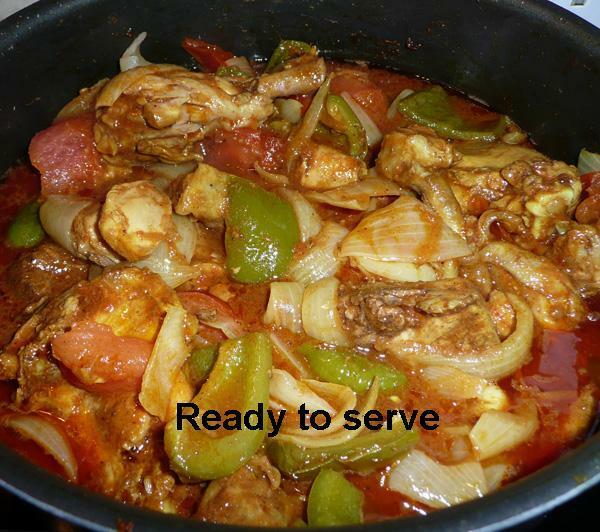 Heat oil or ghee in a wok or karahi. Add sliced onions, green chillies, green peppers and salt, fry for 10 minutes or so. Add tomato wedges, stir fry until onions become translucent and green peppers and tomatoes are half cooked, approximately 10 minutes. Lift out with a slotted spoon and keep aside. Heat 2 tbsp. oil or ghee in a pan, add marinated chicken and stir-fry for 5 minutes on high. 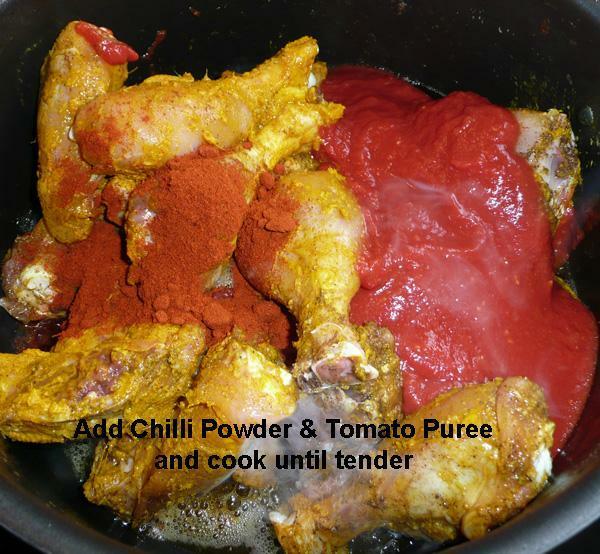 Add chilli powder and tomato pur and simmer on low heat, until chicken is cooked. You dont generally need to add water, but if it is too dry, add a little to stop it from catching. Stir-fry on high until excess gravy is evaporated and chicken looks well fried. 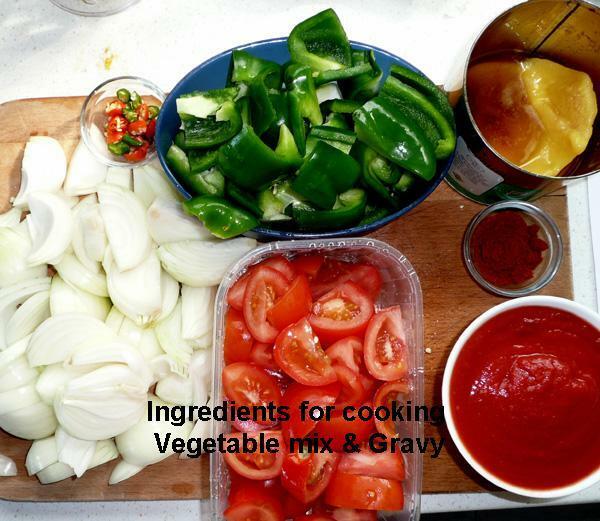 The picture shows more gravy than the traditional Jalfrezi. That is because our family likes thinner gravy in curries. This dish can be prepared up to here in advance. 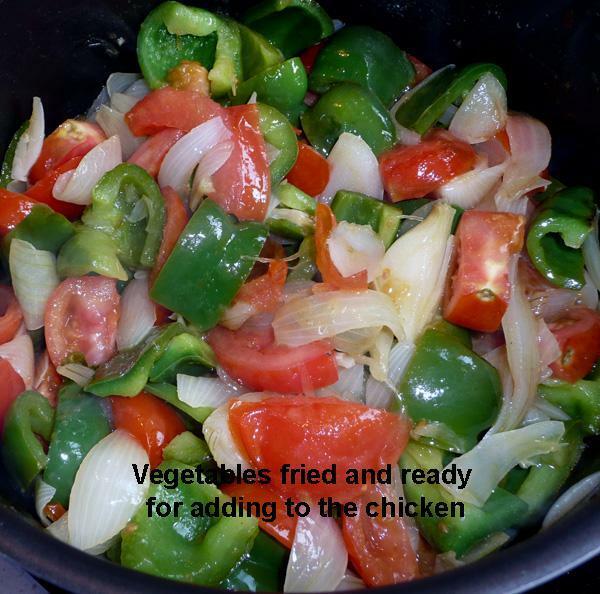 Heat the chicken, add previously fried vegetables and stir-fry for a few minutes, until heated through. Stir in yoghurt/sour cream, if used. Sprinkle green coriander leaves. Give it a quick stir and serve hot with Tandoori Roti or Chapatti. Make sure that the yoghurt is at room temperature. If chilled yoghurt is added to a hot dish straight from the fridge, it may curdle. Or take out a few tablespoons of the hot food in a bowl, mix yoghurt, warming it a bit and then stir it back into the hot dish.